As Sandy’s storm surge flooded lower Manhattan, basements filled with water and generators became inoperable, unless, that is, you had a bucket brigade, like the one I wrote about earlier this week. One such inundated basement belonged to Datagram, the data center hosting the websites of The Huffington Post, Buzzfeed, and Gawker. “How dumb to locate datacenter in a flood zone. And how dumb to host Gawker servers there,” Tweeted Gawker publisher Nick Denton after learning the Gawker website was down along with other sites hosted by Datagram. Before cloud computing came along, companies like Buzzfeed and Gawker had to make big investments in their own network hardware and software. Their staff had to maintain and manage a room full of servers. And they had to make sure all the environmental controls remained constant, to keep their computer equipment healthy. 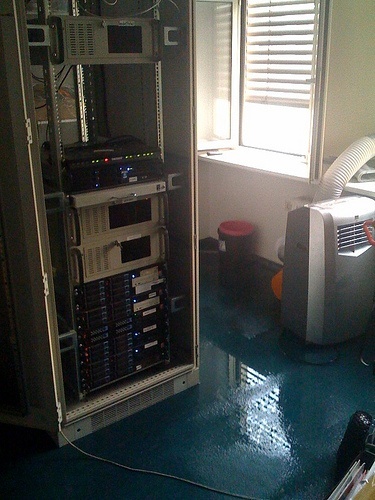 Is Your Data Center a Flood Zone? Now, many companies have moved these critical systems outside the office to data or colocation centers. Many companies think of one thing only when selecting a cloud provider – cost. But there are other very important aspects to consider before moving to a data center or hosted environment. Unfortunately, many companies don’t ask about redundancy, back-up, customer support, and security. A reliable data center uses surveillance, guards, and other security measures to protect against theft and cyber threats, but they also have measures in place to protect their clients from natural disasters. In an ideal world, people select data centers based on their tolerance of natural disasters. In reality, real estate and power costs drive data center locations…The critical thing is that you should never have all your data in one location or even in two locations susceptible to the same disaster. During Sandy, The Huffington Post first lost their data center in New York City, and then their backup in nearby Newark, New Jersey, failed, too. These are issues that make the DelCor Cloud Connection stand out from the crowded cloud marketplace. The data centers that host Cloud Connection are separated by over 650 miles, enough geographic redundancy to reduce or totally eliminate a risk of natural disaster causing an outage at both centers. I bet The Huffington Post wishes they had considered geographic redundancy before signing the contract with their data center.